Robert Tonner Catalogs - 2001 Tyler Wentworth Collection catalog - brand new - straight from Tonner packing carton. 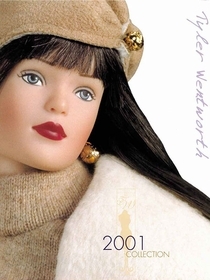 In 2001 the Tonner Doll Company did a separate catalog for the Tyler Wentworth Collection and the 'main line' collection. In this catalog, the dolls and outfits are featured in color, full page photographs. They are presented with a storyline. The first dolls in the Théâtre de la Mode Collection were debuted. In the back of the catalog , are several pages of an Encore 2000 of Tyler's first year collection - all with color photos and descriptions.